The United Nations World Food Programme (WFP), the lead agency fighting hunger, requires voluntary donations for its aid missions. Without these contributions they cannot feed the hungry in Syria, Iraq, South Sudan and many other countries in need. There is alarming news coming from Somalia. The East African nation, which just three years ago suffered a famine, is in danger of a new hunger emergency. The Famine Early Warning (FEWSNET) system is sounding the alarm in Somalia. Lack of rainfall is placing Ethiopia at risk of a severe hunger crisis in the coming months. This development comes on the heels of last year’s massive drought which struck East Africa. What is called the “Belg” rains in parts of Ethiopia were late in arriving this year. Crops have not been able to get planted in time. Ethiopia, which is also hosting refugees who fled the famine in Somalia, will need food assistance in the coming months. The school feeding program becomes urgent because this not only feeds hungry children but keeps them in school. 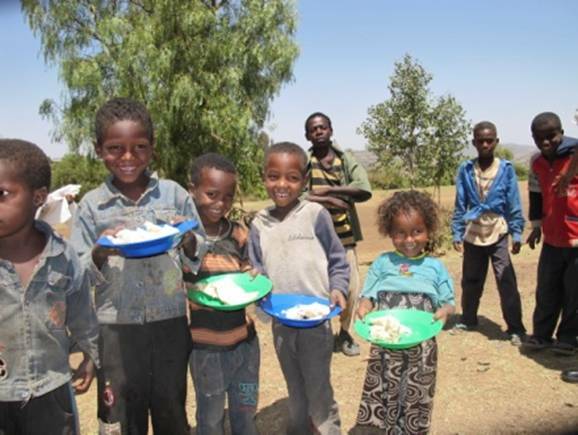 The World Food Programme (WFP) helps provide school meals in Ethiopia. WFP just earned a grant of 26 million dollars for Ethiopia from the U.S. Dept. of Agriculture’s (USDA) McGovern-Dole school meals program. However, these supplies can take as much as 6 months to arrive. So WFP needs help covering the interim period until the McGovern-Dole “cavalry” gets there. With the drought and high food prices taking hold, the USDA and WFP will be working to ensure McGovern-Dole supplies arrive as soon as possible, and finding key interim sources of funding. WFP relies entirely on voluntary donations whether from the public or governments. Judith Schuler, WFP information officer in Ethiopia, provides us an update on where WFP’s school meals program currently stands. WFP is reaching 689,000 students currently. Do you hope to expand the program? Currently WFP’s “Food-for-Education” programme is operational in 1186 schools in 6 regions. Because of resource constraints, there is no plan to expand school meal programme at the moment. What is the funding shortage that you are currently facing? The funding requirement for 2012 is US$ 28.5 million and the shortfall for 2012 is about US$ 17.4 million. Is the school feeding a lunch/breakfast ration? Is there a take home ration aspect? The school meal is provided either as a breakfast or a mid morning snack. But in schools where there are two shifts , the morning shift students receive the meal mid morning and the afternoon shift students receive the meal at mid-day before they start classes in the afternoon. A take home ration of vegetable oil is provided to girls to encourage attendance in the pastoralist areas of the country and where girls attendance is lower due to economic and cultural reasons. Currently 127,000 girls in pastoral areas are benefitting from the programme. What percentage of the school feeding is for refugees and what is for the population of Ethiopia? The School Meal programme for refugees is a separate programme and is run as part of the Refugee Operation. Currently, 35,000 refugee children in all refugee camps benefit from the programme. The regular School Meal programme targets 3 percent of the primary school children in the country. Article first published as School Feeding Vital to Ethiopia As Drought Revisits Region on Blogcritics. 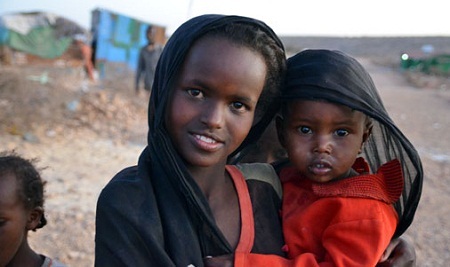 Imagine if you were a child living in the Gebo and Bay regions of Somalia last summer. Instead of having the opportunity to go to school in the fall you were trapped in a massive drought zone. With food supplies low your family would be forced to flee the region as a matter of survival. 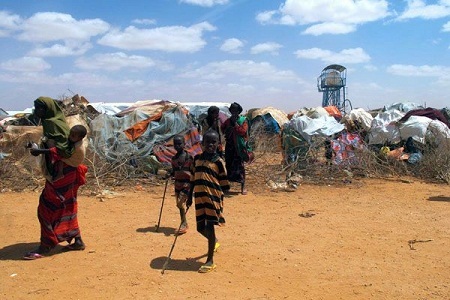 Starting in the summer of 2011 streams of hungry Somalis fled Gebo, Bay and other crisis areas. Some parts of Southern Somalia were declared in famine as starvation had set in. The drought, combined with conflict, placed over 13 million people were put at risk of starvation in Somalia and other countries in East Africa. Thousands of residents of Gebo and Bay are now in the Kobe and Hilaweyn refugee camps in Ethiopia and depending on relief from aid agencies. Save the Children is helping kids within these camps by providing emergency education and school meals. The meal will be a porridge, made of a corn-soy blend, served as a breakfast at school. In addition Save the Children wants to provide school meals to children in the Melkadida and Bokolmayo camps, also in Ethiopia. Save the Children hopes to provide meals to 8,037 children who are currently receiving emergency education in these four refugee camps. And they want to expand the program to reach more children. There are 43,966 school age children in the four camps. Save the Children is also working on the construction of schools to expand educational opportunities. The school meal program, with supplies from the UN World Food Programme, will improve child nutrition. It’s also expected to improve enrollment and enhance the teaching and learning process. Funding though is critical. Save the Children says resources for the program is expected to run out later this year. That is where the public can help by supporting Save the Children’s East Africa appeal. Article first published as Save the Children Starts School Meals for Somali Refugees on Blogcritics. 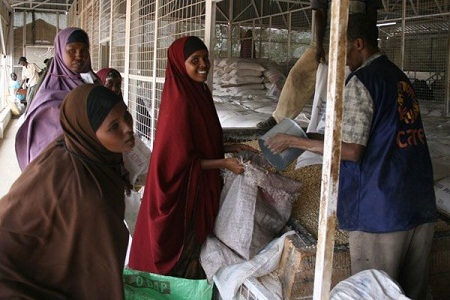 The UN World Food Programme and CARE team up to provide food to refugees who have fled Somalia (WFP/Mariko Hall). Both of these agencies are accepting donations for East Africa. President Obama issued a statement last week thanking Americans who had donated to relief efforts in the Horn of Africa this year. He also cautioned that much more needs to be done to overcome the humanitarian tragedy of 2011. The U.S. has a great tradition of leading the fight against famine wherever it occurs. In 1946, just a year after World War II ended, the threat of massive famine loomed over the globe as food supplies were running low. In this case, the paths of the U.S., Somalia, and Ethiopia crossed briefly. There were no reports of drought that year in East Africa. Of course, any country not in food deficit at that time was a huge relief with the impending worldwide famine. It was going to be enough of a challenge to meet the food needs of the war-devastated countries. Whether or not there is a drought is all about luck. In 1946 there was luckily none in East Africa. This year a different story–a huge drought. What does not depend on luck though is how well nations are prepared to deal with drought. Many actions can be taken by the international community to help build up the resilience of farmers in developing countries so that when drought does hit, it is not catastrophic. Food reserves can also be in place to prevent a year of setbacks from drought and keep a country moving toward food security. So, this is one of the lessons of this year. Invest in farmers today to avoid the famine of tomorrow. Article first published as Remembering the Horn of Africa this Holiday Season on Blogcritics.